Paid to do the unenviable, Finnbogi (Sveinn Ólafur Gunnarsson) and Alfred (Hilmar Guðjónsson) spend their weekdays painting the markings on a deserted road in a remote part of Iceland. With limited company and provisions, and personalities that quite often clash, the duo are forced to live out their lives in a confined space, whether it be the loneliness, their personal lives, or the excitement of the weekend’s freedom. Foreseeably, this results in moments of hostility, amusement and affinity. Simplicity is key here as writer and director Hafsteinn Gunnar Sigurðsson constructs an intimate snapshot into the two men’s lives, battling hardships in the remote terrain. The action may be limited, but it’s through the interplay between these two characters, the part brotherly, part enemy relationship they share and how they each cope with their solitude that brings Either Way into its own. With a script that feels improvised, and their situations barely mentioned aside from neat moments of narration and discussion, imagery reigns supreme. Árni Filippusson’s cinematography is sumptuous, undisturbed and often speaks louder than words, constantly acting as a third character to both Finnbogi and Alfred, and what always brings them back together. Despite the challenges each of these characters face in the time we spend with them – from Finnbogi’s unrelenting optimism for his long distance relationship to Alfred’s desire for more than society believes he should settle for – the landscape is left unchanged and unaffected, presenting the idea that while we’re all-consumed with our own emotions and affected by problems in a variety of different ways, they’re insignificant compared to the real, life-or-death issues. It’s not always beautiful, though, as the narrative’s scarcity and reliance on metaphor prove somewhat tiresome after a certain point. 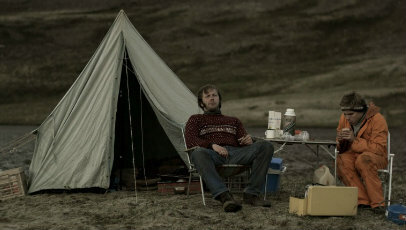 The performances delivered by Gunnarsson and Guðjónsson do wonders to create some particularly noteworthy moments of humour (a drunken wheel-barrow race) and heartache (Finnbogi’s emotional breakdown at the hands of an unfortunate letter and Alfred’s teasing) and its 1980’s setting allows for a level of benevolence most films are lacking. In the end, while it may be limited and somewhat insufficient, it’s a quaint insight into a life far removed from your own.